A resident of Washington DC suburb Woodbridge, VA called the cops when a werewolf was sighted last night. There wasn’t even a full moon Monday night, but an anxious neighbor on Colchester Road told police he saw a werewolf. Police responded to the scene and searched the woods, but there was no sign of the mythical creature, or even a coyote. Gives new meaning to the phrase Vote Or Die. Every generation of teenagers has their own “outsider” sub-culture. Goth, hippie, punk, raver… All pleasantly strange without being scary. But as yet another sign we live in the future, teenagers have finally found a way to freak out even the most die hard counter-culturist. 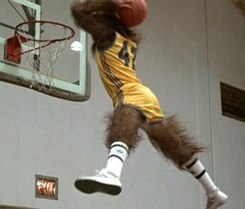 At over a dozen high schools in San Antonio, TX teenagers are transforming into werewolves. While there isn’t much supernatural about these teens (they put together outfits made of fake tales, novelty contacts, fangs, and dog leashes to approximate the real thing) there is plenty weird about it. The kids involved don’t find it terribly odd though. To them it’s not a gang or a cult or a sign they need therapy. They consider their pack a support system, which is a something they’ll desperately need to make it through High School dressed as werewolves. Is this happening elsewhere, or is it just a Texas thing? If you’ve seen a pack of wolves in your town let us know in the comments! You are currently browsing the archives for the Werewolves category.